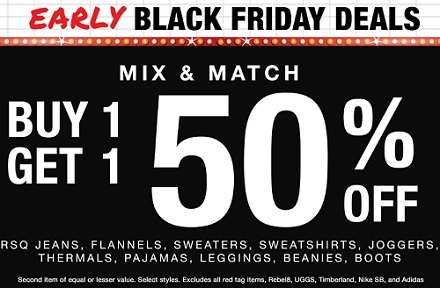 Here we come with information about first Early Black Friday Deal from U.S. TILLYS. Mix & Match: buy one, get one with 50% discount. Valid on RSQ Jeans, Flannels, Sweaters, Joggers, ... Second item must be of equal or lesser value. Hurry up, the offer is time limited and valid at U.S. TILLYS stores or U.S. TILLYS online. Source of the information is U.S. TILLYS.